PSC members were among the thousands of people who rallied and marched across the Brooklyn Bridge Thursday to show their support for Occupy Wall Street two days after police raided and shut down the group's encampment at Zuccotti Park. 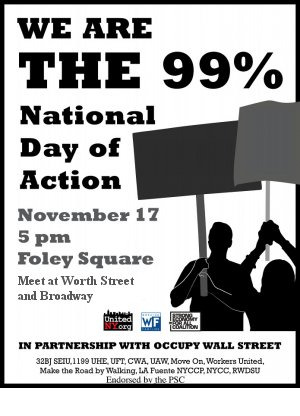 Thursday, November 17th, is a day of a city-wide mobilization to demand economic justice for “the 99%.” Be part of the growing movement to change economic and political policy; be part of the march with the PSC. The PSC will take part in a peaceful, permitted rally and march that will begin at Foley Square at 5:00 PM before winding its way around City Hall and across the Brooklyn Bridge. Our members will meet at the intersection of Broadway and Worth Street at 5:00 PM, before marching together into Foley Square. 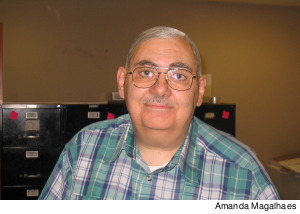 Bill Mulholland, an administrative assistant in the Grievances and Contract Enforcement Department, died at home Tuesday, November 8th following complications from illness. Many PSC members, especially those who worked on grievances, had close friendships with Bill, and we all relied on him. It is a terrible loss. A broad coalition labor and community groups, including the PSC, is working with Occupy Wall Street to organize a mass action at Foley Square and throughout Lower Manhattan the evening of Thursday, November 17th. Please come rally and march for our students at CUNY. They truly are the 99%. New York should be funding their educations, not handing tax breaks to the wealthy and the super-rich. Last Wednesday (October 26), PSC Secretary Arthurine DeSola testified before the New York State Assembly Standing Committee on Higher Education at hearing examining the effects of the current state budget and the state’s new tuition policy. In her testimony, Secretary DeSola reaffirmed PSC’s position that CUNY should be funded with pubic dollars, not endless tuition hikes. 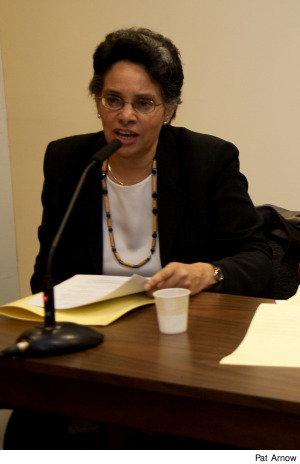 She also called for continuation of the state millionaires’ tax, and told the legislators that the state must fund all of CUNY’s mandatory cost increases. If you are an adjunct who has not yet joined the New York City Teachers’ Retirement System (TRS), please fill out an enrollment form immediately. 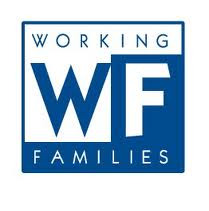 There will be drastic consequences for adjuncts who delay enrolling in TRS if the New York State legislature agrees to pension changes recently proposed by Governor Cuomo. We are borrowing the text from a Move On alert to its members. 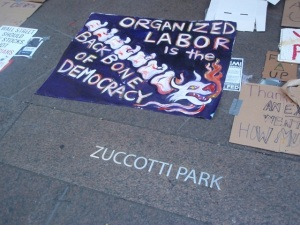 The City of New York is threatening to shut down Zuccotti Park tomorrow at 7:00AM. Now more than ever, those who have stood up to Wall Street greed need our support. Chanting “banks got bailed out, we got sold out”, more than 800 demonstrators paraded through the Upper East Side Tuesday afternoon bringing protests against inequality and the excesses of Wall Street to the doorstep of some of New York's wealthiest residents. Konstantin (Costas) Panayotakis is an Associate Professor at the New York City College of Technology focusing on social theory, political economy and environmental sociology. He’s also an active member of the NYC Tech PSC chapter and a member of the PSC Delegate Assembly. 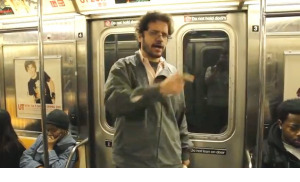 In his spare time he rides the subway and talks to strangers—seriously! Costas’ alter ego is “Austerity Nut,” a hyper-capitalist, true-believer who preaches the need for working people to “sacrifice for our suffering brothers and sisters in Wall Street.” Whenever he can, he shares his inspiring message of tax breaks for the rich and service cuts for the rest of us with straphangers throughout the city.